Aktieselskabet Fyns Forsamlingshus, Nominal 25 Kronen. Odense, 23 May...more Aktieselskabet Fyns Forsamlingshus, Nominal 25 Kronen. 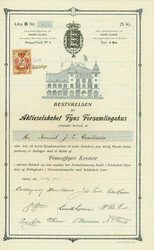 Odense, 23 May 1910, Share of 25 Crowns, Litra B, #177, 34 x 21 cm, black, beige, KB, picture of a house. The town hall was originally built in 1900 and renovated several years ago. The house is now hired out. There are a theatre, an advertising agency and retail businesses. 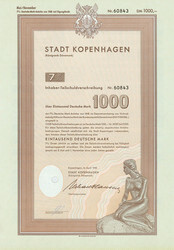 Danish Government, Nominal £ 1.000. 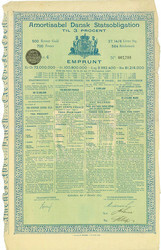 1 February 1947, Specimen of a...more Danish Government, Nominal £ 1.000. 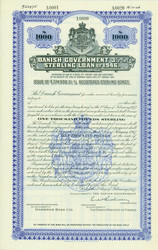 1 February 1947, Specimen of a 3.5 % Serling Loan of 1946 for £ 1,000, #A00000, 39.5 x 24.2 cm, blue, black, cancellation holes, KB, printed by Bradbury, Wilkinson & Co.
City of Copenhagen, Nominal US-$ 1.000. Luxembourg, 1 September 1967,...more City of Copenhagen, Nominal US-$ 1.000. Luxembourg, 1 September 1967, Specimen of a 6.5 % 20 Year Eighth Centenary Loan of 1967 for US-$ 1,000, #00000, 21 x 29.7 cm, red, black, coupons. Aktieselskabet de Forenede Gummi- og Luftringefabriker Schiønning &...more Aktieselskabet de Forenede Gummi- og Luftringefabriker Schiønning & Arvé, Nominal 500 Kronen. Copenhagen, 12 December 1973, Share of 500 Kronen, Litra A, #1779, 4 pages, rest of coupons. 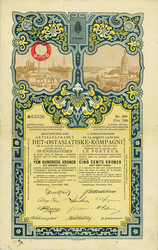 1896 errichtet, bestand die bedeutende dänische Gummifabrik in Nørrebro bis 1983. Es wurden PKW- und LKW-Reifen, ab 1934 auch Reifen für Sonderfahrzeuge mit einer Achslast bis zu 10 Tonnen produziert. Sijn Koninglijke Majesteit van Denemarcken, debet aan de...more Sijn Koninglijke Majesteit van Denemarcken, debet aan de Stad Amsterdam, Nominal 99.750 Gulden. 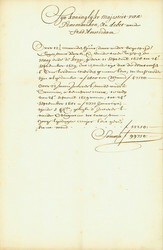 24 September 1681, Receipt for repayment of 47,500 Gulden capital and 52,250 Gulden interest = 99,750 Gulden, 31.5 x 20.3 cm, black, beige, folds, manuscript on handmade paper with watermark. Kjøbenhavns Telefon Aktieselskab, Nominal 1.000 DM. Copenhagen, July...more Kjøbenhavns Telefon Aktieselskab, Nominal 1.000 DM. 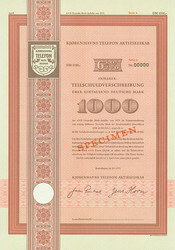 Copenhagen, July 1973, Specimen of a 6.5 % Bond for 1,000 DM, Series 6, #0000, 29.7 x 21 cm, red, brown, red specimen overprint. Stadt Kopenhagen, Nominal 1.000 DM. 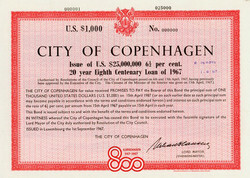 Copenhagen, April 1968, 7 %...more Stadt Kopenhagen, Nominal 1.000 DM. 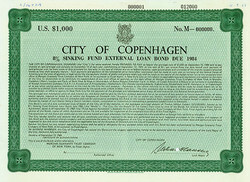 Copenhagen, April 1968, 7 % Bearer Bond for 1,000 DM, #60843, 29.7 x 21 cm, brown, grey, hole cancellation, view of the mermaid. Copenhagen, 15 September...more City of Copenhagen, Nominal US-$ 1.000. 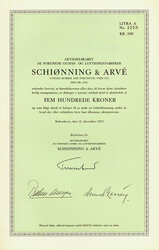 City of Copenhagen, Nominal 1.000 Schweizer Franken. Copenhagen, 15...more City of Copenhagen, Nominal 1.000 Schweizer Franken. 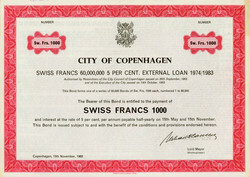 Copenhagen, 15 November 1963, Specimen of a 5 % External Loan 1974/1983 for 1,000 Swiss Francs, o. Nr., 21 x 29.7 cm, red, black, white, right edge a bit tanned, otherwise EF, coupons. Aktieselskabet Det Ostasiatiske Kompagnie / Société Anonyme...more Aktieselskabet Det Ostasiatiske Kompagnie / Société Anonyme det Ostasiatiske Kompagni, Nominal 500 Kronen = 700 Francs. Copenhagen, December 1918, Share of 500 Crowns = 700 Francs, #63526, 36.2 x 22.9 cm, yellow, blue, brown, black, 4 pages, some coupons remaining, horizontal fold, bilingual: Danish, French, very decorative, rarity! R10. The company was founded in 1897 by the captain Hans Niels Andersen. In 1918 it changed to a joint-stock-company. It operated several shipping lines to East Asia. It also traded with rice, oilseeds, wood and spices. The company grew to the largest company in Denmark. Together with his subsidiaries Russian American Line and Baltic American Line the company was in the 1990th one of the largest shipping companies worldwide. Today the company name is East Asiatic Company. The company is separated in EAC Foods, EAC Industrial Ingredients and EAC Moving & Relocation Services. 1850, Zeitungsausschnitt mit Ansicht der Börse in Kopenhagen. Frederiksberg Usfiftens Kirkegaard / Golbjerg Kirkegaard, Nominal...more Frederiksberg Usfiftens Kirkegaard / Golbjerg Kirkegaard, Nominal Begravelfesbrev. 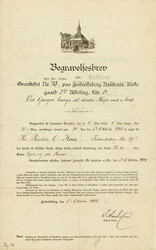 Frederiksberg, 6 October 1884, Begravelfesrev, #85/1180, 35.8 x 22.2 cm, black, white, DB (fold with long tear), folds with tears. Amortisabel Dansk Statsobligation til 3 Procent, Nominal...more Amortisabel Dansk Statsobligation til 3 Procent, Nominal 500 Goldkronen = 700 Francs = £ 27.14.6 = 564 Mark. Copenhagen, 1 December 1897, 3 % Bond for 500 Goldcrowns = 700 Francs = £ 27.14.6 = 564 Marks, Lit. C, #7708, 46 x 29.3 cm, green, blue, some coupons remaining, horizontal fold, tears, one up to 3 cm, small pin holes, text in four languages: German, French, English and Danish, superb designed coupon sheet.